EagleChild designed and created beautiful "Good Medicine" Sterling Silver Jewelry that was hand crafted, hand polished, and personally signed by EagleChild. EagleChild Designs is a reflection of his jewelry creations. 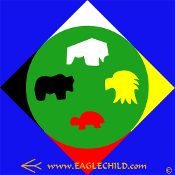 EagleChild handcrafted Bear, Buffalo, Eagle, and Turtle totems for his jewelry creations.